Tutubi took a ZestAir Flight to Puerto Princesa from Manila and got a rather usual experience of a ZestAir flight unlike some reports of delayed flights nor pretty flight attendants. Why does Tutubi like ZestAir so far? ZestAir is using the old Manila Domestic Airport Terminal (sometimes called NAIA Terminal 4) which is very accessible to public transportation and metered taxis. Just a short walk out of the airport terminal you can ride jeepneys going to Baclaran to ride the LRT or you can ride buses to take you to EDSA. Metered taxis are plentiful while the nearby parking area is not always full unlike the overnight parking at NAIA terminal 3. ZestAir offers lower fare prices than Cebu Pacific on regular schedules. Tutubi tried to do mock flight bookings against Philippine Airlines and Cebu Pacific for this one. Tutubi's error that he initially thought ZestAir flight fares will rise on the days nearing the flight date, but it actually got lower near his trip to Puerto Princesa, not sure though if it was influenced by the offering of a Cebu Pacific promo when he booked a flight for a friend who joined him in Palawan. ZestAir flights to Puerto Princesa have better schedules to fit Tutubi's itinerary much lower cost than Cebu Pacific that saved him half-day of his time to wander. You can book your ZestAir flights online using not just your credit card (Visa, mastercard) but even your BancNet ATM card. You can also do this with Philippine Airlines and Cebu Pacific but not yet with SEAIR and Airphil Express. ZestAir was on time, Tutubi didn't get a rumored bad service or Zest delayed flight experience. But it's only a round-trip flight and not much flying time with the rejuvenated airline owned by the same owner of Zest-O juice drink. ZestAir flight re-booking fee is around PhP600.00. You need to visit the nearest ZestAir booking office nearest you to do this. Try calling ZestAir hotline number for details and inquiries. Tutubi's wish for ZestAir? 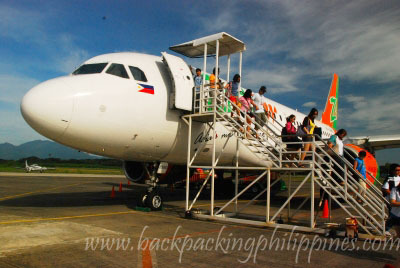 Resurrect ZestAir flights to Batanes to give SEAIR a run for its money and drive flight fares down. As always, this is not a paid advertorial of ZestAir nor did Tutubi get anything, in cash, kind or free flights from ZestAir, for this glowing ZestAir review. You may post your own Zest Airways review, comments, feedback, even horror stories, by clicking the comment button. You had a good experience with Zest Air while I did not. I took Zest Air to/from Puerto Princesa last month. With only one counter, the check-in looked as it would take a long time to finish, but when the other counters were free, the long line was distributed. Good! However, the departure lounge was really packed. It became obvious as scheduled flights except the Caticlan flights on smaller planes were delayed 2 to 5 hours and my flight to Puerto Princesa was delayed by 2.5 hours. I thought the Air traffic Controller must be overloaded. Terminal 3 had delayed flights too. I thought Zest would redeem itself on the flight back. The plane landed early and we boarded it early. It was a good feeling as a competitor aircraft was delayed and I had a bonus- an exit seat which I really relished. But the departure was delayed by about an hour since there was a discrepancy between the manifest and the actual count. Ground personnel were too inefficient to check why. After going through the manifest row by row, staff personnel finally asked who was not called. I was glad the guests paid attention. She was not able to determine early on that she skipped a row, it would have been over earlier since the missing 3 passengers were near the first few rows. Flight crew was not bothered to explain as to the delay and most passengers never knew why. Next flight would be delayed again. Another thing bothered me on this leg, one of my seatmates professed to be prone to airsickness as she scooped a big amount of katinko ointment from me. She should not be seated there. I hope Zest Air hires or trains better ground personnel. It would be great if they fly to Batanes! the more choices of airlines the better it is for the consumers. Zest Air's online booking only accepts credit cards as of the moment. ATM cards aren't yet available for their online booking. As for the airfare getting lower as the travel date neared, I may have an idea. Perhaps at the time of Tutubi's booking, there was no announcement yet of a promo fare being offered. Maybe when he checked again Zest Air was offering lower fares. I've flown Zest Air over 40x & I'm quite satisfied with their service. I also agree that Zest Air should go back to Batanes. SeAir's offerings are just TOO MUCH. Nice post on Fort Santiago sir.Sad to say I haven't visited this place eventhough I studied in Intramuros. :/ I'm planning to tagged along my kids to visit this place next week. zest biggest come-ons include terminal which is proximate to the public transport, up-front fare quotation (no deceptive add-ons unlike cebu pacific and airphil). however as competing low cost carrier, it also has its share of limitations that adversely affects its passengers like maximizing the use of its aircrafts to different destinations in a day. this company practice has plane-safety implications which, God forbid, may result to untoward incidents. the same practice is also the ultimate cause of the regular delays of its flights. when the first flight gets delayed it has a domino effect on the subsequent flights of the same aircraft. im flying with zestair next year,, i hope it will be a good one.